There are some films that become famous, or maybe infamous, simply by existing. Films that have such interesting behind the scenes legends that the film itself, and it’s relative merits, become almost irrelevant. You just HAVE to see it, because it just shouldn’t exist. 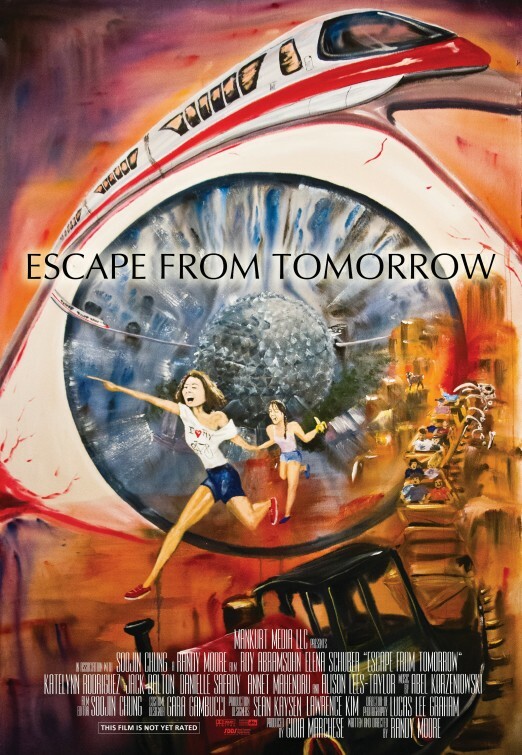 When writer/director Randy Moore’s “Escape From Tomorrow” premiered at Sundance this past January, it pretty much immediately became one of those films. Here we have a feature film that as shot, at least in part, guerrilla-style, in Walt Disney World and Disneyland, while the park was in operation. The cast and crew simply got on the rides, walked around the park, and filmed scenes in the midst of a regular tourist-filled day in the parks. No one caught them, and in some of Moore’s stories the staff seemed to not even care. Of course, we are talking about two locations that probably have more video cameras per square mile than any other on Earth. Maybe it wasn’t as hard as we’d imagine it would be. My guess is it would be more difficult now, as opposed to when Moore pulled it off. Still, all that aside, it’s a pretty amazing story, and it led to lots of discussion about the legalities of what this team did. Lots of stories about what the Disney reaction might be. Would anybody get to see this film? The answer is apparently, yes. As the film will be opening at the Music Box in Chicago on Friday. However, I can’t help feeling this William Castle-style vibe, “The film THEY didn’t want YOU to SEE!! !” Even if, it seems, Disney doesn’t really care, or feel they have legal grounds to do anything. In truth, that is all prologue to the film itself, which is the story of Jim White (Roy Abramsohn), an average American husband and father, who is on the last day of a Walt Disney World vacation with his wife, Emily (Elena Schuber), daughter Sara (Katelynn Rodriguez), and son Elliot (Jack Dalton). 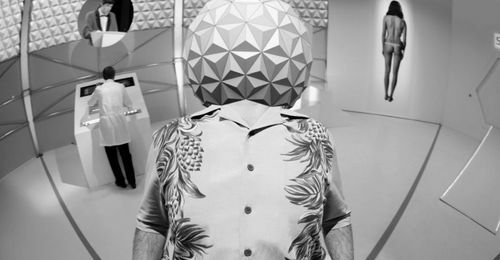 The film, and day, begins with Jim being fired by telephone, he chooses to hide this, and travels into the parks (only the Magic Kingdom and EPCOT are shown) determined to complete the trip without disturbing the family. When they enter the parks, events take a turn to the dark, and bizarre. From fairly realistic creepiness, such as Jim’s obvious sexual attraction to a pair of French teenagers, and Elliot’s rather disturbing Oedipal obsession with his mother, to shenanigans that can only be described as insane. The film starts dark, and goes down the wormhole from there. The first thing to say is that the cast, especially the central family, is quite good, especially Abramsohn and Schuber. They set up a very realistic baseline of a couple who’s coming to the end of a vacation and are just on the edge of a real meltdown. As Jim’s behavior becomes more and more erratic, Schuber finds the right line between a woman who’s realistically trying to keep the family on track, and becoming a shrill harpy. You understand why Jim feels a bit hen-pecked, but can also see her side, and when the moments come that her frustration bubbles over, they feel earned and honest. Abramsohn has the flashier role, but I also think he stumbles a bit. I don’t blame the actor here, because the moments when his performance stumbles are the same moments when the entire film stumbles. In short, I felt the film was at it’s strongest when it was at it’s most realistic. 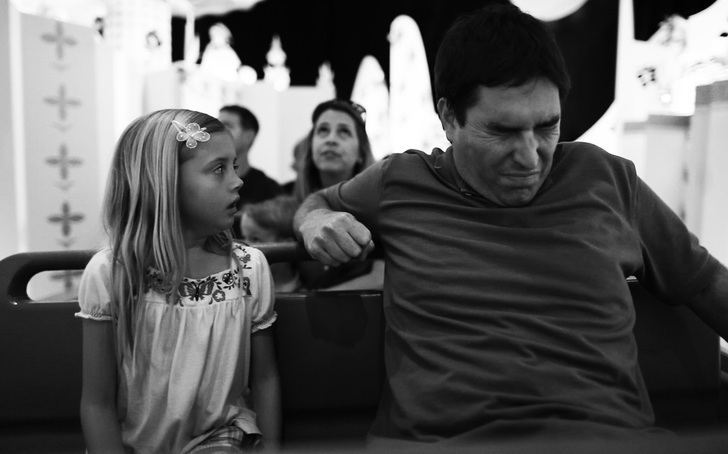 When the family meltdowns happen, I flashed back to the moments I’ve seen, and experienced, while in Disney parks. It’s clear that Moore is after satirically exposing a dark underbelly to the Disney experience. Which, even as a Disney fan myself, I see as a fine target for satire. The problem is that he uses a shotgun when a scalpel would’ve made a greater impression. The film literally crams every possible nightmare Moore could conceive into the film, and, frankly, the returns diminish. The moments that are about a real family dealing with real pressures, such as when Jim starts drinking heavily in the EPCOT World Showcase, are vastly more compelling, and hit the point that Disney parks’ illusion of perfection is just that, an illusion, than when he delves into corporate conspiracies and prostitute Disney Princesses. One is left with the distinct impression that less would’ve been much more. I also find myself wanting to mention certain technical aspects of the film, even if, knowing the difficult choices made for filming, and the low-budget, make me feel they’re a bit unfair to critique. The effects work, within the context of the film, moves the story along, so, take these comments with that in mind, but some sequences are fairly jarring. Specifically, I would point to moments where, for whatever reason, scenes could not be completed in the park. Moore solves this by shooting the cast on greenscreen, and merging that footage with plates shot on the Disney property. There is an change in image quality and “feel” every time this happens, and it did throw me. I think I’d have been more apt to let this slide if not for the fact that, late in the film, there are some more overt effects shots that are impressive and realistic. 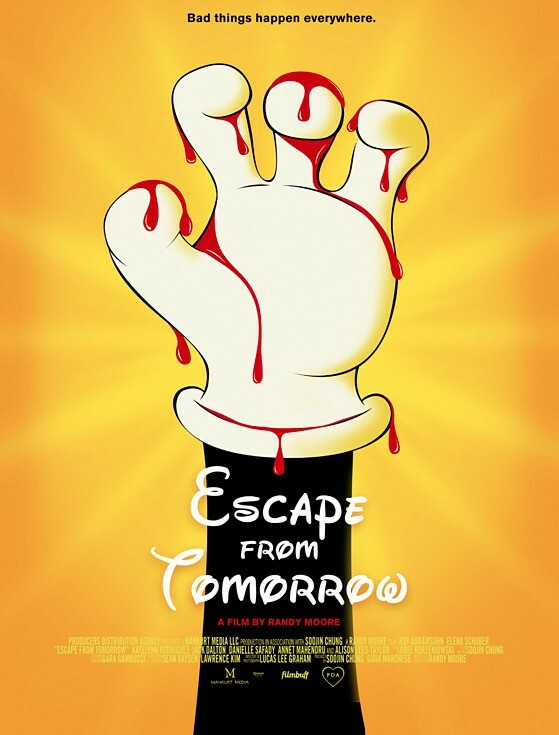 I end up feeling somewhat torn about “Escape From Tomorrow.” The film works, if you approach it as, for lack of a better term, a gimmick production. The footage they were able to assemble from shooting in the Disney parks is impressive, and if your goal is to see something that subverts the Disney image while featuring the actual Disney property, the film will fulfill that. However, I could’ve help but feel that, for all the effort, Moore could’ve created a simpler, more pointed, realistic narrative that might actually say more. Disney generates a lot of deep emotions, in either direction, and I think Moore sees both the good and the bad in what the parks provide. I wish he’d had more faith in the human elements of the story he dreamed up. I agree. I gave it 2 stars as well. But I am impressed with the ambition that Randy Moore has with his feature-length debut. I think he really has a talent that he’s uncovering… and while Escape from Tomorrow had more than it’s fair share of hiccups, it will be a learning experience for Moore and something that he can grow from… he has a lot of potential to be a really good writer and director.